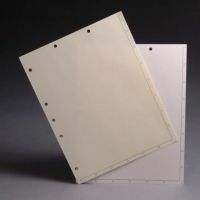 Step #1: Enter your desired quantity of index divider sheets. Step #2: Pick your tab titles and the quantities you want of each. Step #3: Hit the Add To Cart Button at the bottom of this page. Organize your patient files with our complete do-it-yourself indexing system. Create up to thirty-eight individual divisions of the patient charts. Use as few or as many necessary to organize your files efficiently. Self-adhesive tabs are brightly colored for instant recognition. They are Mylar laminated for extra long life.